اتصالات تیر به ستون، در سازه های بتن آرمه، به ویژه در قاب های خمشی، نقش مهمی در رفتار لرزه ای اینگونه سازه ها ایفا می نماید. در قاب های مقاوم لرزه ای، هدف اصلی طراحی برای گره اتصال، این است که تا زمانی که مفاصل پلاستیک در اعضای قاب، شکل گیرد، گره های اتصال، الاستیک باقی بمانند. در این مقاله، ابتدا به معرفی اتصالات تیر به ستون بتنی، نیروهای اتصال، ناشی از بارگذاری ثقلی و جانبی و انواع اتصالات داخلی، خارجی و گوشه پرداخته شده است. همچنین مکانیزم های انتقال نیرو در اتصال تیر به ستون در دو حالت بدون آرماتور عرضی (خاموت) و با آرماتور عرضی (خاموت)، تشریح شده و رفتار لرزه ای اتصالات و انواع خرابی های ایجاد شده در اتصالات ناشی از زلزله در سال های اخیر، بحث شده است. در ادامه، مقاومت برشی اتصال، بررسی شده و الزامات مهار میلگرد طولی تیر و ستون، بیان شده است. 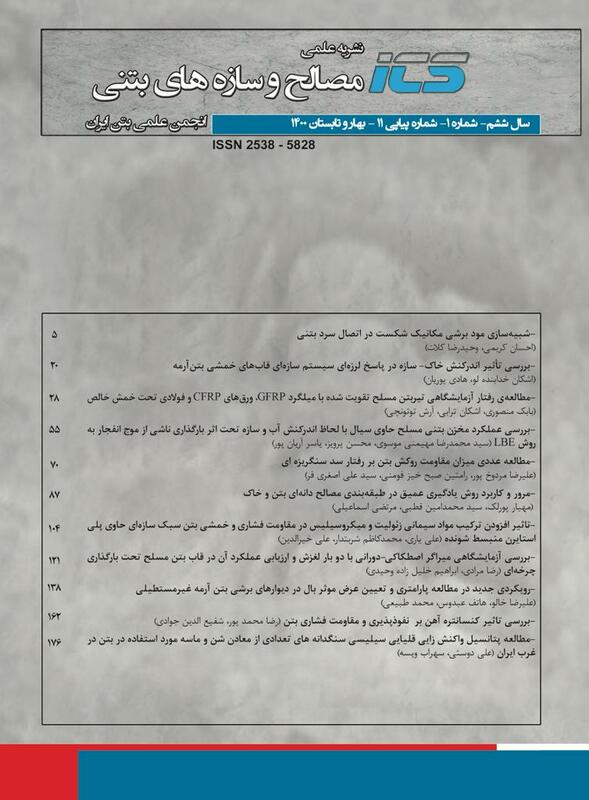 سپس ضوابط طراحی اتصالات تیر به ستون بتنی، از دیدگاه آیین نامه ACI 318-2014، مبحث نهم مقررات ملی ساختمان سال 1392 و آیین نامه بتن ایران (آبا)، با یکدیگر مقایسه گردیده است. Beam-Column connections in reinforced concrete structures especially in moment frames play an important role in seismic behavior of such structures. In seismic resistant frames, the main objective of designing the connection is that as long as the plastic hinge is formed in the frame members, connection nodes stay elastic. At the first section of this paper, concrete beam-column connections, connection forces due to gravity and lateral loading and all types of internal, external and corner connections are introduced. Also, force transmission mechanisms in the beam-column connection in both cases including with transverse reinforcement and without transverse reinforcement (stirrups) and the connections seismic behavior and types of destructions resulted by earthquakes are discussed. Then, the shear strength of the connection is investigated and containment requirements of the beam-column longitudinal reinforcement are expressed. Finally, the concrete beam-column connections design criteria from the perspective of Code ACI 318-2014, Chapter 9 of National Building Code, and Iranian Concrete Code (ABA) are compared with each other. Based on the researches conducted in every field and the previous experiences as well as considering proper safety, the codes have adjusted a series of regulations upon which the reinforced concrete structures must be designed so that the structural engineer will be able to conduct a reliable and proper design based on the general design principles and regulation of a code. Moehle J. (2015), "Seismic Design of Reinforced Concrete Buildings", McGraw-Hill Education. ACI Committee 318 (2014), "Building Code Requirments for Structural Concrete (ACI 318-14)", American Concrete Institute, Farmington Hills, MI. NEHRP Seismic Design Technical Brief No. 1 (2008), "Seismic Design of Reinforced Concrete Special Moment Frames: A Guide for Practicing Engineers", National Institute of Standards and Technology (NIST). مبحث نهم مقررات ملی ساختمان، ویرایش چهارم (1392)، "طرح و اجرای ساختمان های بتن آرمه"، دفتر مقررات ملی ساختمان. نشریه شماره 120 (1382)، "آیین نامه بتن ایران (آبا)"، معاونت امور فنی و تدوین معیارها. راهنمای مبحث نهم مقررات ملی ساختمان، (1390)، راهنمای کتاب "طرح و اجرای ساختمان های بتن آرمه"، دفتر مقررات ملی ساختمان.